As the weather forecast threatens snow, the wind is quite bitter and the need to moisturise never greater (don't forget the SPF) there is also the need to ensure your lips stay kissably soft and smooth, who wants to kiss someone with bits of skin flaking from their lips - grim! One brand that you can't help but notice with its bright cheerful yellow packaging is Carmex. This cult classic all began with Alfred Woelbing back in the late 1930's in America suffering from dry, chapped lips and with a knowledge of kitchen chemistry he was able to hand make his special formula. Selling out the back of his car to pharmacists the demand grew and grew. Now over 130 Carmex products are sold every minute worldwide still with the original formulation. I am sure you will either be familiar with the a squeezy tube or a little pot but it comes in quite a few varieties, shapes and sizes and with that a range of scents too. The thing I love about Carmex is the ingredients include camphor and beeswax to hydrate, soothe and protect along with Camphor Oil which relieves painful chapped skin and of course the menthol scent which tingles. A product which can be used under lipstick and acts really well as a base or on its own, you can find on the high street in stores such as Boots and Superdrug and it won't break the bank when you purchase it with prices starting at just £2.69. Are you a Carmex fan? Oh my I could really do with some Carmex. My lips have been so chapped lately and lush lip scrub isn't helping. I'm gonna have to get myself to Boots this weekend. Do you know I've not bought this in years and just remembered how much I liked it! I LOVE Carmex. i always had their original balm back in uni, but have recently gone for their scented ones and I love them! I love Carmex, always used to have the tube in my handbag. Have since changed to the little pot, but still as good. Love the different types of packaging and scents it comes in! Carmex is great! I love it, and it is in my bag always- every single winter! I didn't know they do tube thing as well! very handy! I go through this stuff like water. My lips are always so cracked in the winter. I love carmex so much - it is a life saver over the winter months! 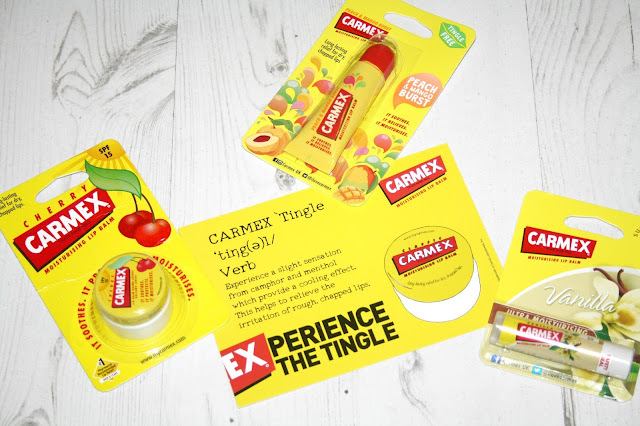 Hands up I am a carmex fan, a must have for dry lips in the winter!